Bees are amazing builders and well known for hexagonal structures found in their nests. The structure of bees nest has inspired many artists, architects, and scientists. For those wanting to take a closer look at bees nest, there is a possibility of buying a bees nest and installing it in your home. As a bonus, if you take good care of the bees you can even harvest some honey from them. However mesmerizing bees nests can be, finding an unexpected nest on your house or property can mean bad news. If left untreated the nest could produce a swarm which can be dangerous to any humans and pets close to the area. Before you attempt removing the bees nest, it is essential to figure out the type of nest to be able to decide on the best approach. But first, what is the difference between bees nest and beehive? Usually, the term beehive is used to describe the nest of any bee colony, but scientifically there is a difference between a hive and a nest. Hive describes a human-made structure which houses a honey bee nest. Nest describes bee colonies which live in artificial or natural cavities or hanging structures. Solitary bees do not build nests; they find a protected spot where they can lay eggs, build cells, and live. Usually, they prepare the nest in the ground, in wood, or cracks in the wall. Solitary bees don’t build nests out of wax; they use other materials which depend on the type of solitary bee. We will mention most common types of solitary bees and the specifics of their nest. Leafcutter bees nest is built in rotted wood, thick-stemmed plants and similar materials which bees can easily cut. They use existing holes to lay their eggs in them and don’t create holes or damage structures to make holes. Mason bees prefer nest sites which face south and dig holes in mortar joints or bricks. They usually make nests in the old or poorly maintained mortar which is a common problem for such structures in summer months. Mason bee digs a hole and coats it with a smooth material; the hole is then filled with bee bread (a mix of pollen and nectar) which serves as food for larvae. Miner bees burrow in the ground where they make a labyrinth of tunnels in which they lay eggs. Carpenter bees dig holes in dead wood, which can be destructive for wooden structures such as sheds and porches. However, they rarely do any serious damage. Bumblebees prefer cool and dry shelter, so they make their nest underground. They can even take over abandoned rodent or bird nests. Bumblebees nest often resembles a pile of debris because it is covered in leaves or animal fur which serve as insulation. Their nests are only used for one year, and then they are abandoned. Bumblebees might reappear at the same area next year, but they won’t use their old nest. The location of a nest is dependant on the temperature, in colder climates bees nest is built inside a shelter such as a hollow tree while in warmer climates bees might build their nest out in the open. Honey bee nest is easily recognizable by hexagonal cells which are used to raise young bees and to store pollen and honey. The nest is built from wax which honey bees create with their special glands. 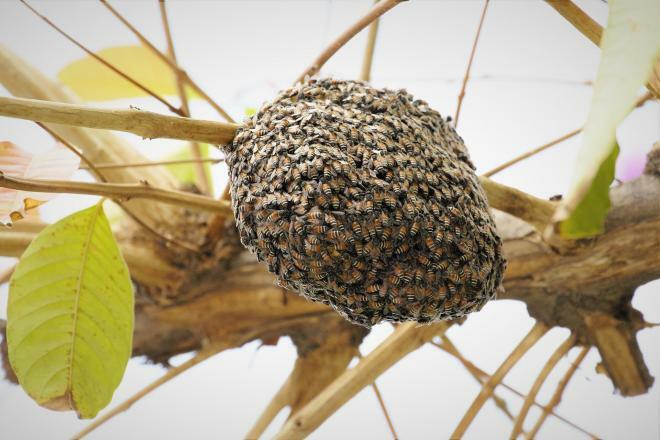 Wasp nest is similar to honey bee nest (also has honeycomb-shaped cells), but it is built out of plant fibers and mud. Such materials make the nest look papery and fragile. Wasps usually build their nest in sheltered spaces with easy access to the outside such as roof spaces, wall cavities, sheds, garages, etc. How to deal with a bees nest? Solitary bees are beneficial and harmless, so usually you should be able to leave the nest alone. They do not have pollen baskets on their legs, so they lose a lot more pollen than social bees, which makes them excellent pollinators. Usually, the nests are unguarded, so they pose no threat to humans. Some people even welcome them by setting up mason bee homes and bee hotels to attract them. If you are interested in getting a bee house, we have choosen a few of our favorites which you can check here. Solitary bees are not aggressive and do not swarm, which makes them safe around children and pets. Bumblebees are peaceful and abandon their nest in autumn so it would be better to leave it alone whenever possible. However, do not lean over the nest or breathe on it as that can agitate bumblebees. You should deal with the nest only if it is in an area with a lot of people or pets, and the best way is to just relocate it. Bumblebee pollination is important for the growth of vegetables, fruits, and flowers. Since only the queen overwinters to create new brood in the spring, destroying a colony with future queens can destroy several generations of bumblebees. Relocating the bees nest isn’t easy as the nest will most likely get destroyed and the bumblebees will attack. We do not recommend doing it yourself, try to find a professional who is willing to do it. Another way is to relocate the entrance to the nest using some flexible tubing with a diameter of at least 2 cm. Place one end of the tube at the nest entrance and seal any gaps with loose soil, the other end should be placed where you want a new entrance to be. Bumblebees can travel through the tube in and out of the nest. Since bees use visual landmarks to find an entrance to the nest, you should help them find a new entrance by placing something like plant pots, pebbles of contrasting color, etc. As with bumblebees, if you find an unwanted honey bees nest you shouldn’t kill the bees and should first try to relocate it. Honey bees are endangered and have great value for the environment and our agriculture. The safest and easiest way is to call a local professional who will gladly relocate the nest without harming the bees. If you cannot get a professional to come to remove the nest and the nest is hanging, you can try to do it yourself. But try this ONLY if you can see the queen cell and aren’t allergic to bee stings. For this method to work you have to wait till nightfall because then bees are less active and most likely asleep. For your safety, you should wear eye protection, a hat, gloves, and thick clothes. Blowing smoke on the nest can help because it confuses and conceals the pheromones which bees use to trigger an alarm, so it might prevent guards from attacking. A great tool for that job is a bee smoker, an essential part of the equipment of every beekeeper. If you aren’t familiar with a bee smoker, you can find more info here. Under the hive place a plastic lined box so the honey cannot seep through when the nest is dropped in the box. Detach the nest with a broomstick or something similar and make sure that the queen cell is in the box. The colony will follow the queen, so if the cell is not in the box the bees will stay. The box with bees nest should then be closed and moved somewhere else. We must warn you that you should not try to remove the nest if it is inside the walls or some other structure inside your home. By spraying pesticides or chemicals on the nest, you could agitate the bees and make them aggressive. For such nests, it is better to leave the removal up to professionals who can do it safely. Furthermore, even if you manage to kill the nest, dead larvae and honey can attract other pests which can create an even bigger problem. Wasps are known to be more dangerous than bees so you must be very careful with their nest. They are easily provoked and, unlike honey bees, can sting multiple times. If you notice a wasp nest close to your home, you should not ignore it as it can be dangerous. We urge you to find a professional and try to deal with a wasp nest yourself only if that is your only option. Relocating the nest can only be safely done once all wasps are dead. Wasps are territorial so leaving an empty nest can deter new wasps from moving in, some people take advantage of that by buying fake wasp nests. If you have to exterminate the wasp nest yourself, be sure to protect yourself with thick clothes, eye protection, a hat, and gloves. Seal all openings to prevent wasps from crawling under your clothes; you can use duct tape for that. Wait for nightfall when the wasps are less active and react slower. Use only red or amber light for illumination because wasps will react to a flashlight or artificial light. Or you can try it at early morning when you have just enough light to see what you are doing. Before doing anything to the bees nest you should have an exit plan in case the wasps attack, and don’t do it alone. Puff the wasp killing dust in and around nest openings and leave, remember not to use any aerosol sprays on the nest. You can use an aerosol insecticide only to kill wasps that might be on you or following you. Spraying, burning or drowning the nest could be incredibly dangerous. Let the powder do its work for a few days, and if necessary repeat the process. Bees are an essential part of an ecosystem, but unfortunately, their numbers are going down. Scientists are still trying to figure out the reason for their decline but are currently unable to say what exactly caused it. However, one thing is certain, a world without bees would be very different. Many of our vegetables and fruits that we enjoy every day are pollinated by bees and could be eradicated without them. For that reason, we strongly advise you not to destroy bees nests. Any unwanted bees nests you should first try to relocate, whether yourself or by a professional. If you aren’t sure which type of nests it is, your best option is to call a professional who will safely relocate the nest.